Do The Links That Penalize You In Google Match To Those In Link Tools? Home > SEO Copywriting > Link Building > Do Link Tools Help Find Your Really Toxic Links? I've been playing around with various link tools for the past few weeks, some much longer than a few weeks, but recently I've been playing with the Link Dtox tool from Link Research Tools. It is a very impressive tool but I really wanted to see if it matched up with what Google says are the problem links with sites. So I've been waiting for Google to publicly reply to a recent unnatural link complaint in the forums and they did this morning. A Google Webmaster Help thread has a site complaining about an issue, where Google's Aaseesh Marina responds with two example links that is causing the site to have unnatural links. The links he calls are are from freebie-articles.com and articlesfactory.com. So what I first did was plug in this site's URL into Majestic SEO to get all the links they have in their index for that site. It came back with over 3,700 links pointing to the site. But the two links mentioned by Google were not in Majestic's report. You need to feed Link Dtox links from Google Webmaster Toolkit, Sistrix, SEOmoz/Linkscape, or Majestic. Since I have access only to Majestic, I used that. Obviously, it would be preferably to use Webmaster Tools in this case. So what I did was manually add those to links to the Majestic report and uploaded it to Link Dtox. 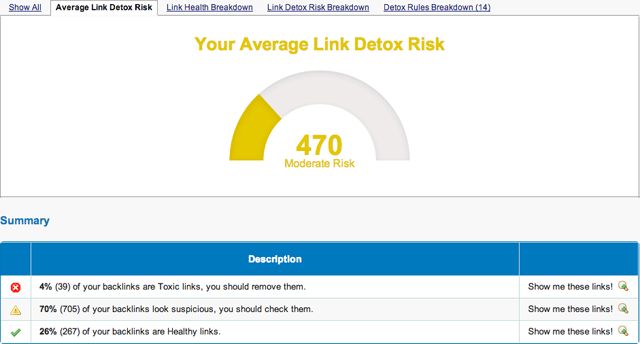 Link Dtox came back calling these links as "moderate" risk, specifically labeling them SUSP16: Article Directory Links. I've been looking at Dtox reports over the past two weeks, I ran about seven reports on quality sites and poor sites. By looking at the Link Dtox report, based on Majestic links, not Google links, and comparing it to reports for this site and rustybrick.com (both my sites), I would have assumed the site Google called out for bad links would not have been flagged by Google at all. Now it isn't 100% fair because I am comparing Google Webmaster Tools links to links via Majestic SEO. 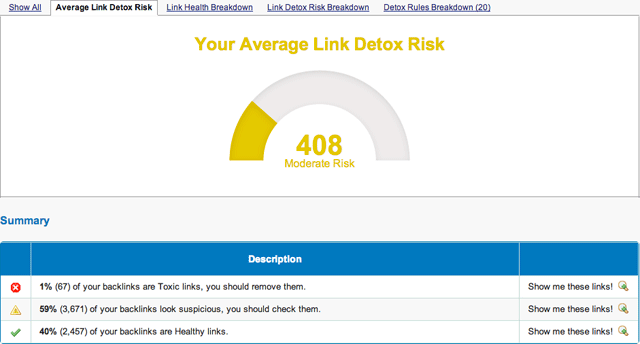 But when I plugged in the two examples from Google as to links actually hurting a specific site, those links only came up as only moderate risk with Link Dtox. Either way, I find all these tools incredibly useful and they all have their place. As you say, it’s correct, the more links you upload in addition to our own sources, the more precise the result will be.